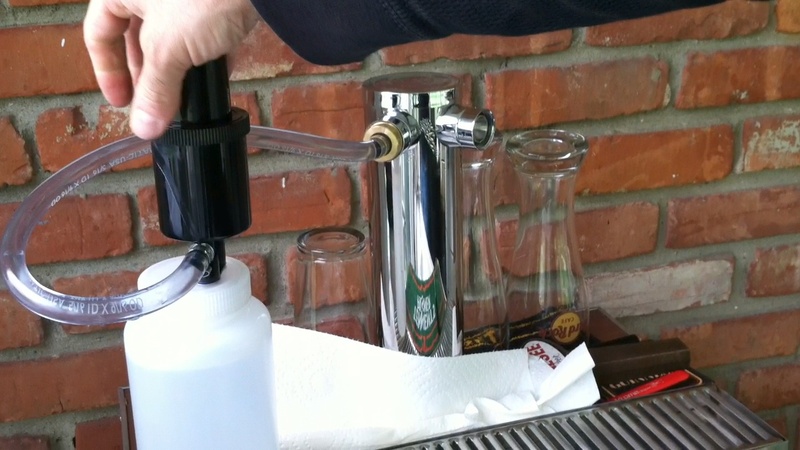 I clean my kegerator beer lines before I put freshly kegged beer in, since I don’t want to introduce any off flavors and also to remove any potential bacteria, before serving. I bought a beer line cleaning kit, which is basically a pump with a 1,000mL container (1 Quart). I also have some beverage system cleaner to mix and use with the beer cleaning system. 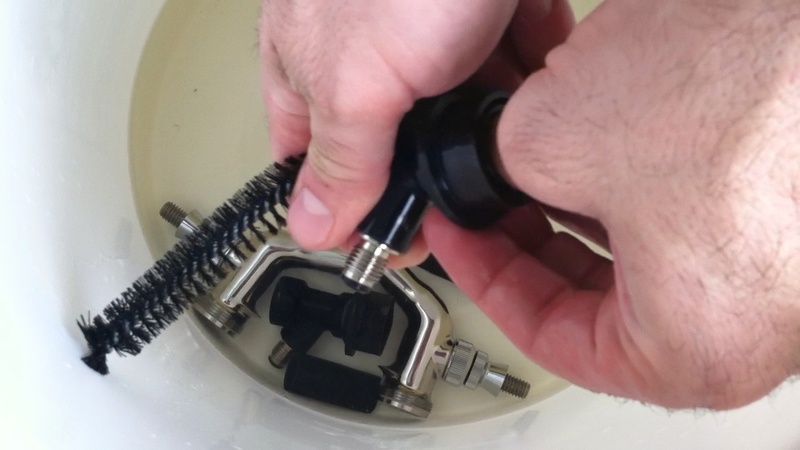 These beer line cleaning kits make the cleaning process much easier. They can be a little expensive, but this one was well made and worth the cost. Today I’m going to clean my beer lines. I just put some new kegs of beer in there so I want to make sure my beer lines and tap faucets are clean before serving. Whenever I change out my kegs I always clean my beer lines and faucets. I bought a beer lining cleaning kit, which is basically a pump with a 1,000mL container (1 Quart). I filled that container with warm water. I also have some beverage system cleaner, which will be one tablespoon per quart of water. I have to take my taps off using a wrench. The Perlick faucets, per their instructions, say they need to be removed to clean. Some systems say you do not have to pull everything off. If you have to remove them, soak them in the solution for about five minutes. I just loosened mine to clean. The solution should be re-circulated though the beer lines for about 15 minutes. That will be tough for my set up. Once it pushes through I’d have to refill the container. What I’m going to do is re-circulate it to a bucket and let it run through a few times. Then using fresh water each time, I’ll run that through a few times to rinse it. I also have a brush that I can use to scrub the inside of the faucet. 1:54 I will first mix the cleaner, making sure it does not touch my hands because it’s not supposed to. Now I’m going to start putting all the pieces in my bucket and make sure the beer line runs into the bucket (after removing the black ball-lock connector). I connect the pump from the container to the beer line where the faucets mount to the beer tower. It’s like a big siphon; once it starts it flows through very nicely with a simple pump, and empties into the bucket. 3:25 Now that the first pass is complete, I’m going to take the solution that’s in the bucket and pour it back in the container, and repeat a few more times. Something I have done in the past, and like to do for time saving and more cleaning pressure, is to continuously pump the solution nice and hard so you get the speed up, instead of relying on the siphon alone. 4:08 Before I rinse out the lines, I’m going to dip my cleaning brush into some solution and clean the inside of the faucets before I begin rinsing everything. 4:30 The final cleaning step will be to (using my brush) really clean out all the pieces that have been soaking in the bucket. Then lastly, I will rinse everything off a few times with warm to hot water and reassemble.